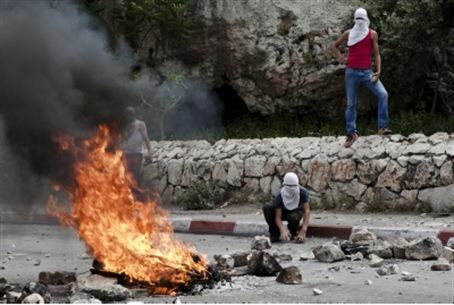 The Almagor Terror Victims Association slammed a report by ACRI, which attacks police for taking measures against Arab rioters and stone throwers. The Almagor Terror Victims Association has called for the authorities summarily to reject the newly released report of the self-described Association for Civil Rights in Israel, which attacks the police for taking measures against Arab youths responsible for the now prevalent terrorist attacks in eastern Jerusalem. These attacks are especially common in the case of visitors to the ancient Jewish cemetery on the Mount of Olives. In the report, ACRI says that Arabs living in areas beyond the security fence complain that police do not enforce the law in their neighborhoods, and that “anti-riot measures are often used excessively in the center of crowded neighborhoods.” In addition, the report takes issue with the police for the arrest and interrogation of minors who engage in terrorism. However, Alamgor says, the report fails to offer a practical way to stop the terrorism short of these means. “Thus the Association for Civil Rights in Israel ironically prefers to maintain a purported civil right not to be held responsible for acts of terrorism over the overriding civil right of not being murdered or seriously maimed,” the Almagor response says. Israeli officials believe that the PA itself is engineering the throwing of rocks and Molotov cocktails at Jews in predominantly Arab neighborhoods of Jerusalem, purposely using minors in order to attempt to circumvent the Israeli legal system, which in non-terrorism cases deals leniently with minors. Similarly, the report says, Fatah, Hamas, and other factions have a history of sending minors to carry out terrorist attacks at Israeli checkpoints, and terrorists targeted by the IDF commonly surround themselves with women and children. Almagor CEO Meir Indor, who was injured in an attack in the area, said, "Children and youths are used purposefully for these attacks in a cynical attempt to escape the punishment due terrorists. This is not juvenile delinquency―this is organized terrorism. The PLO and its associates will not stop abusing their children by using them for attacks on Jews unless Israel makes clear that this will not pay. “Unfortunately, minors who have grown up in Judea, Gaza, and Samaria under Arafat and Abbas are all too willing to be abused in this way. Since Israel handed control of these areas to the PLO in 1994, their schools, media, and mosques have been used to rear a generation that rejects peace and murderously hates Jews,” Indor added.